Long since the columns were and remain an integral part of the classics, made in the spirit of antiquity. 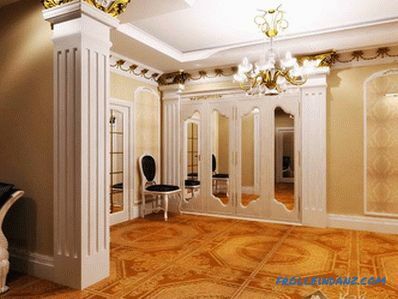 Decorative columns in the interior, created in a classic style, give the room grace and luxury. In the design of modern interiors, the columns perform a more decorative role than they bear the functional load. Thanks to the use of these elements in modern styles such as loft, underground, hi-tech, their functionality and technogenicity are emphasized, and special expressiveness is also given to the room. In such interiors columns look very specific - it can be metal pillars, finished with rough concrete. This decorative element fits well with today's art deco style. 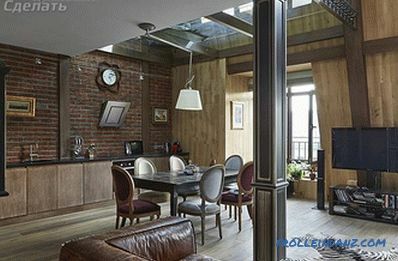 If the bearing pillars are not provided in the construction of the house, the columns in this style will give a juicy accent to the building, emphasize the uniqueness of the chosen style and streamline the space of the room. Column or Latin "columna" translates as a column of cylindrical shape, but there are also columns of square and polyhedral cross-section. 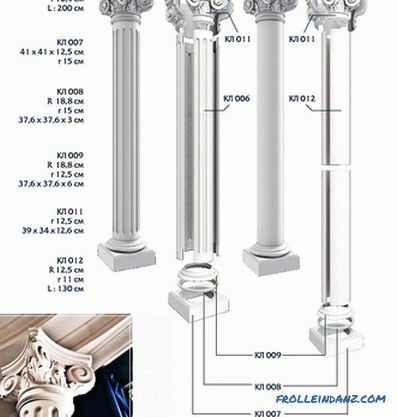 Columns have always been considered a symbol of classical and antique architecture. At one time, they served as supporting structures, and over time they began to be used as a decorative element. 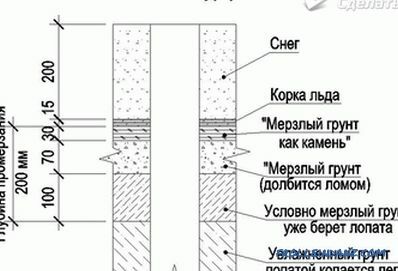 A column as an element of architecture, consists of a base, central and upper parts. The base or base is the bottom of the column that carries the entire load. The base is decorated with horizontal grooves. The central part is the column with a characteristic smoothness or decoration, presented in the form of a trunk decorated with flutes or vertical grooves. 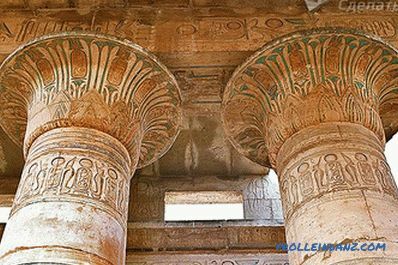 The upper part or capital is the most expressive part of the column due to the variety of decorative elements. It can be majestic bas-reliefs, volutes or spiral curls and palmette in the form of a symmetric ornament with leaves. As a reliable support, powerful cylindrical columns carried the load of high ceilings , decorated with numerous and varied stucco, which significantly weighted the weight of the structure. They were made of marble and other expensive types of stone. In modern design, columns are actively used as a decorative element of the interior, and in this regard, the most extraordinary solutions are implemented, both for large houses and for small-sized housing, including small apartments. 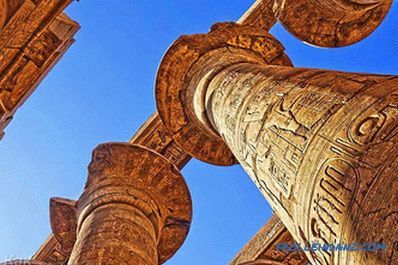 If earlier Architectural pillars were made primarily of decorative stone, granite, marble and basalt, but today this tradition is followed only if the columns act as supporting structures. 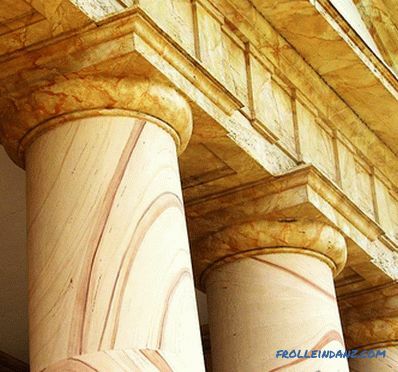 Since in our time the main purpose of the columns is decorative, due to the high cost of materials there is an alternative solution in the use of non-natural materials such as gypsum and polyurethane. 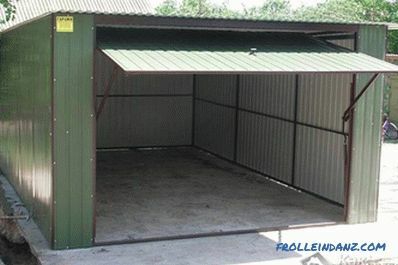 polyurethane finished products can be purchased in specialized stores relatively inexpensively or made to order for the selected sketch. 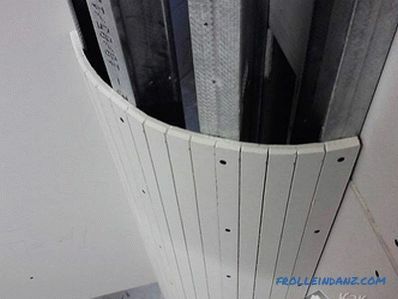 Along with the advantages of polyurethane, there is a disadvantage due to a change in the color of the unpainted columns some time after their installation. The modern interior also uses plasterboard and wood columns and metal. Wooden columns can be decorated in country style, rustic or ecostyle. Metal columns have found their use in minimalism or high-tech style. Columns of silver color are perfectly combined with technology or decorative elements of the same shades. 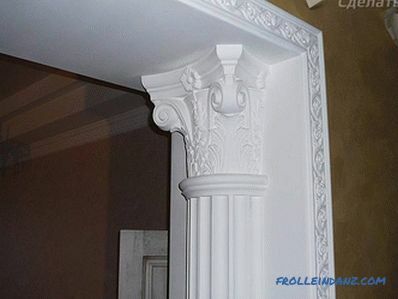 The most common function of columns - decorative. In order for everything to turn out beautifully, you need to know how to beat the column in the interior. This will be discussed further. With the help of columns you can disguise supporting structures or unsightly communications. Thanks to the columns, you can make zoning of space. 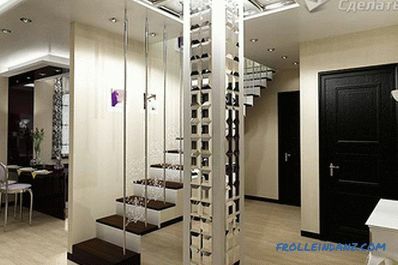 To implement this idea, you can decorate the entrance to the room or visually select the dining area using the columns. Using vertical stripes to create a high ceiling effect, you can visually expand the space of the room. 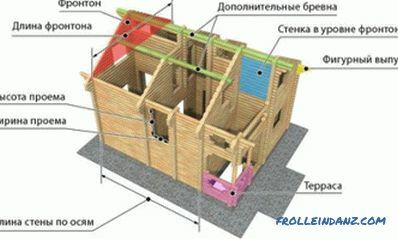 The most common purpose of the columns is to perform the support functions of the structure. 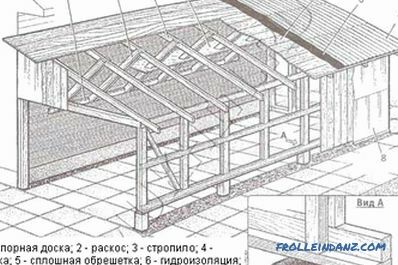 If the interior of the room is made in antique or classical style with their high ceilings, decorated with stucco, in this case the weight of the structure is weighted, and the columns will be very useful. The use of columns in the interior of the room has a practical feature. These design elements can play the role of shelves and cabinets. As a material for such an idea, polyurethane or drywall, which are less durable than granite or marble, will be required. Today Thanks to the development of the construction industry and the rich world of design, you can create a luxurious living room interior with columns. There are the following types of columns: colonnades or arched colonnades; paired columns or semi-columns, combined arch; semicolumns. The colonnades in the interior are needed for zoning the space. And thanks to the arched colonnades, a clearer local zoning is achieved. The use of colonnades makes it possible to create an airy and easy, but at the same time distinct division of space into zones, unobtrusive separation of the room. The design, made with the help of this functional element, significantly changes the aesthetic appearance of the interior, creates an original fascinating atmosphere that allows you to escape from problems and worries. The traditional way of organizing columns is paired columns. They can be installed on either side of a flight of stairs, a window or a fireplace. With the help of paired columns located on the opposite wall, it is possible to efficiently zoning a space with selected functional areas. And if you combine the paired columns with an arch, then you can designate a clearer division of space into separate zones. In a room with sharp protrusions of walls that require careful camouflage, paired columns installed next to the ledge will help restore stylistic unity and hide unsightly factors. For such products, you can use inexpensive materials that mimic stucco. The role of paired columns in the interior is also more decorative than functional. 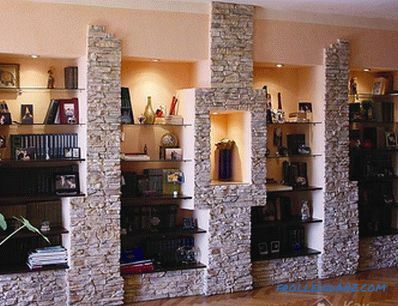 Half-columns - an element that creates the effect of a column protruding from the wall. Semi-columns, as well as columns, establish for the visual demarcation of space, placing a stylistic accent, for example, on a window or a fireplace. Since there is no functional load on the half-columns, they do not have strict requirements for their mounting. They are enough to fix on the wall so that they become an expressive element of the interior. 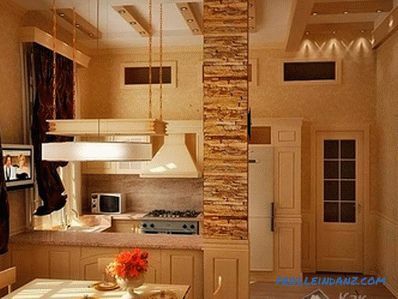 It is better if the column corresponds to the interior style, color scheme and design. 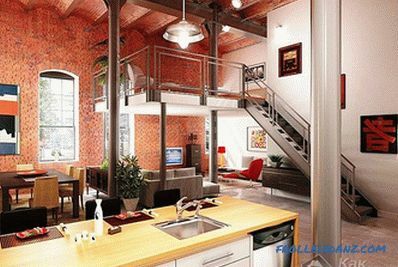 Installation of decorative columns is acceptable only in the conditions of spacious premises. In small living rooms they will not look so impressive, except that if you use polyurethane columns to decorate the fireplace. As the decor of the column can perfectly fit into the interior of a studio apartment, as well as living rooms with a second light. 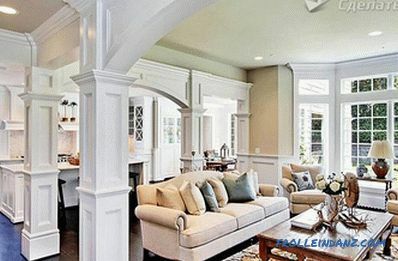 in open-plan rooms columns are an integral part. But in order for the column to look organically against the background of the room and bring aesthetic satisfaction, it needs to be properly designed. The impressive size of the column can be revetted with a decorative stone. 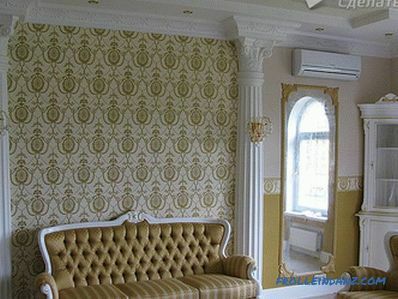 This is an up-to-date design technique, as it combines the interior and exterior of the room by adding facade decoration materials to the living room interior. Modern design provides an interesting design option for adjacent columns. They can be combined to form a rack for figurines or favorite photos. In order for the rack to harmoniously fit into the interior, it is sheathed with material from which upholstered furniture is made in the living room. If the column is located near a soft zone or a rest zone, surrounding it with a bookcase, you can create an ideal corner for storing collection wines or books in luxurious binders. In the case when it is not easy to decide on a place for a TV in the living room interior, You can use the column as a media center. The electric lighting in the column niche looks quite elegant. Here, an ancient sculpture or an expensive vase will rightfully take the place of honor. Another fashionable technique is to arrange the column around the seat with a soft back. 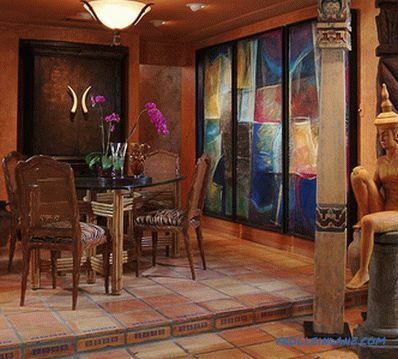 In the interior design of the living room it is best to use columns with arches, mirrors, photographs and paintings. This will give the room majesty. Perfectly miniature columns will also fit into the living room interior About a meter from vinyl, ceramics or clay. They can be used as stands for vases of flowers. On the column that performs the function of the thumbs, you can put an elegant lamp and photos in openwork frames. 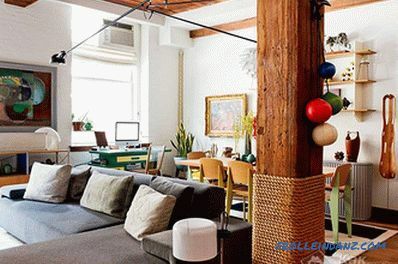 Thus, the columns give the living room a solemn and unique look. They will surely become the subject of admiration of the guests and will give amazing beauty to the interior.